Urine stains and odor on a mattress will always create problems when it comes to cleaning. It’s a smelly liquid that can change the ambiance of your room, especially when it gets into the mattress. Children are prone to such “incidents”, especially babies who are left without diapers on mattresses without protective cover. In a bowl, mix 8 drops of hydrogen peroxide with 3 tablespoons of baking soda and a few drops (3-4) of liquid dishwashing detergent. Mix until the baking soda dissolves. Using a funnel, pour the mixture into a spray bottle. 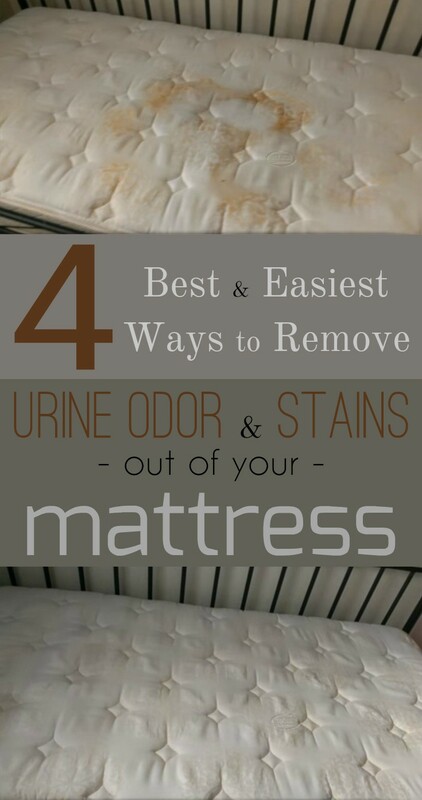 Spray the solution over the urine stain and expect its penetration in the mattress. Careful! The solution is effective for a short period of time. Apply it immediately before mixing. Wait until the mattress completely dries (you can put the mattress in direct sunlight for a faster drying). Finally, vacuum the residue from the surface of the mattress. Mix vinegar with liquid soap in a proportion of 2/1. Thus, for 1 cup of vinegar you’ll use half a cup of liquid soap. Wait half an hour for the solution to penetrate the mattress. Use a clean sponge to soak the solution off the mattress, then you can use the vacuum cleaner. Put baking soda over the stain to absorb the remaining moisture. After the baking soda dries, vacuum off any debris on the mat. Apply a trade upholstery solution (according to manufacturer’s instructions). Brush the stain from the outer edges to the center. This avoids spreading the stain in question. Allow the surface to dry completely. If the odor persists, you can apply an upholstery spray. If you don’t have such a spray, you can use baking soda or vinegar (applied with a sprayer). After the area dries, vacuum any residual powder from the mattress surface. Mix the enzyme-based stain remover solution and apply it according to the instructions provided by the manufacturer. It’s important to use the correct amount of the cleaning solution (an amount equal to that of urine is required). After the mattress stained area dries completely, vacuum until there is nothing left on its surface.